Time has Taken its Toll at Monmouth Battlefield's Craig House ~ The History Girl! Situated in the middle of farm fields, within earshot of bustling Route 9, is a colonial-era home, settled well before the American Revolution. This property, now known as the Craig House, witnessed first-hand the struggle for independence, as it played host to the Battle of Monmouth, the longest sustained battle of the American Revolution. Once in danger of musket fire, cannons, and fire, the home faces a totally different set of risks associated with being a historic site within Monmouth Battlefield State Park today - a lack of funding, deferred maintenance, and dwindling attendance. The Craig family settled in New Jersey from Scotland in 1685. The family, consisting of John Craig Sr., his wife Ursula, and their children James and Archibald, lived in Perth Amboy for ten years. On June 11, 1690, John acquired a 150 acre tract in what is today known as Freehold. He built a home about 1710 and moved to the farm with his family. In 1720, John's son Archibald purchased a piece of property on the eastern border of present-day Monmouth Battlefield State Park and built a home. In 1744 the property passed from Archibald to his son Samuel, who constructed a one-and-a-half story Dutch frame home in 1746. Samuel died later that year and ownership reverted back to his father, Archibald. When Archibald died just a few year later on March 6,1751, his will left the property to Samuel's son John Jr. At that time, John Jr. was only fourteen years old and unable to own the property. The farm was rented to tenants until John Jr. reached the age of twenty-one in 1758. Once John Jr. took ownership, he built a three-bay, two-story, side-hall plan Georgian-style addition on the western end of the house about 1770. His 200 acre property also contained a barn, corncrib, smoke house, and hay barrack. 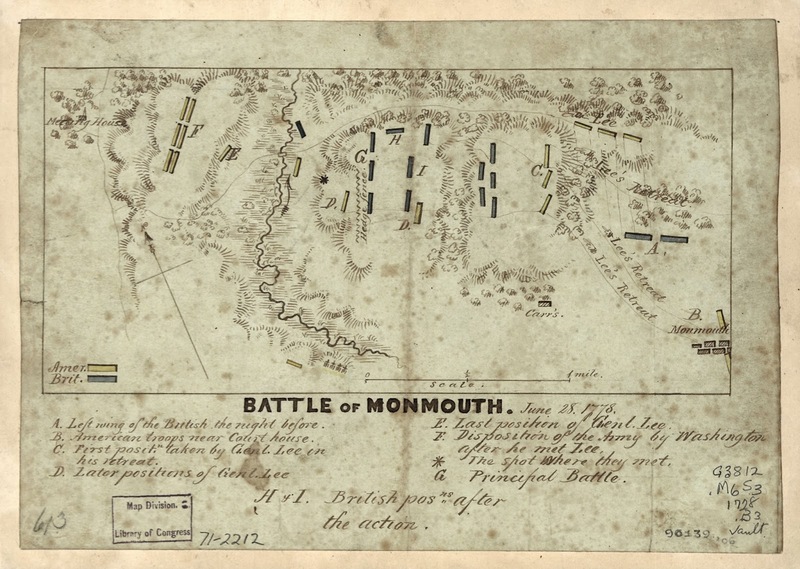 Just eight years after the addition, on June 28, 1778, the British, numbering about 10,000 men, clashed with the American forces, consisting of approximately 14,000 soldiers, on his property and at nearby Monmouth Court House. The American Army, under the tutelage of Prussian drillmaster "Baron" Frederick von Steuben the previous winter at Valley Forge, was prepared as a well-trained army, capable of demonstrating their abilities on the battlefield. "Battle of Monmouth, June 28, 1778." Library of Congress, Geography and Map Division. Realizing that the home would be an epicenter during the battle, John Craig's wife, Ann, who was alone at home with their three children, decided to abandon the property and head toward Upper Freehold. At this time, John Craig was away from the home serving in the Revolutionary War with the local militia. Legend holds that Ann hid the family silver by dropping it in the bottom of the well on their property. It is said that British soldiers drank from the well until it was nearly dry and discovered the silver, which they took with them. With the house vacant, the British used it as a makeshift field hospital during the battle. The day of the battle was extremely hot, with temperatures reaching one hundred degrees Fahrenheit. The majority of the battle occurred between Old Tennent Church and the Monmouth Courthouse in Freehold. General Charles Lee was the commander of the striking force; his soldiers were unable to stand on their own after an attack by the Monmouth Courthouse. Washington was angered by Lee's lack of management and took charge as commander of the battle. The battle raged on all day in the swamps, forests, and fields in the heat. It would be the longest sustained battle of the Revolutionary War. Of the 30,000 engaged troops, about 501 died. Half of the deaths were attributed to heat stroke. That night the fighting ended and Washington was planning his strategy for the following morning. However, during the night, the British managed to escape. After the battle, the Craig family returned to their home and John, Jr. lived there until his death in 1824. The property was divided among his children; his son Jonathon received one-half and his daughters, Amelia and Mary, each received one quarter share. Mary died in 1839 and her share, along with Jonathon's was deed to Amelia. Ameilia passed in 1855 and her daughter Anna Maria took possession of the property. It remained in her name until her death in 1898. It then passed to her husband, Enoch, who in turn passed it onto his son Samuel Craig Cowart in 1908. Samuel lived in Freehold and rented out the house to tenant farmers. A year after his death, in 1943, the property was sold to Ernest Tark. Tark used the space to house migrant workers. The State of New Jersey acquired the Craig House in 1965. Unfortunately, it was badly deteriorated and heavily damaged during its time as a home for migrant workers. Portions of original wood paneling and trim had been ripped out and burned to heat the home. In 1990, one of the first tasks of the newly-formed Friends of Monmouth Battlefield was to restore the house and reopen it to the public. In 1993, the restored home reopened as a furnished house museum, relating the story of the Craig family while they lived there during the American Revolution. Time and the elements have not been kind to the Craig House. Since its opening, the house was closed for a number of years due to staff and budget shortages, and has recently reopened thanks to a staff of volunteer docents from the Friends of Monmouth Battlefield. Time and the elements have not been kind to the house. A broken window on the second floor, now boarded up, prevents visitors from visiting the second story. Outside, the paint has deteriorated and is peeling on almost all sides, there are numerous broken or missing shutters, and the window sills are rotting due to a lack of general upkeep. What should be a gem for the State Park is in serious need of stabilization. Due to its sporadic openings, its remote location from the main section of the park, and lack of public programming and publicity, the home does not see a high number of visitors. Hopefully the State of New Jersey will recognize and value this eighteenth century home and its significance as a field hospital during the American Revolution. A new visitor center opened in 2013 but no money was spent on stabilizing the Craig House or any of the other dilapidated farmhouses on the State Park property. If a preventative maintenance plan is put in place, along with the necessary exterior improvements, the Craig House will remain an integral part of Monmouth Battlefield State Park for generations. Thanks for this update on the Craig House. While it was nice to see money spent on the visitors center, perhaps protecting the actual historical structures should have been a higher priority. Do the friends have any resources to hire an architectural preservationist, or must that go through the state?